Senior nurses have issued an "unprecedented warning" about hospital ward staffing levels in England. The Safe Staffing Alliance, which includes the Royal College of Nursing and Unison, says wards regularly have one registered nurse caring for eight patients - which they say is unsafe. 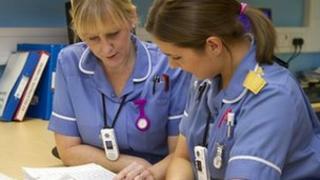 Labour urged ministers to "ensure that all hospitals in England have enough staff to provide safe care". The government said hospitals were responsible for their own staffing. The Safe Staffing Alliance, which also includes the Patients Association and a number of directors of nursing at English hospitals, was formed last summer. It says the one nurse to eight patients ratio should not be regarded as a minimum acceptable level of staffing, and says research has shown the risk of harm and death increases if a nurse is asked to look after more than eight patients. It is calling for any instances where nurses have to look after more than that number of patients to be publicly recorded and investigated. The alliance quotes a survey of nurses at 31 English hospitals, in which just under 3,000 people took part. They said that wards were run with the one-to-eight ratio about 40% of the time. In a statement, the group said: "For the sake of clarity, more than eight patients per registered nurse is the level considered to be unsafe and putting patients at risk. It is not a recommended minimum. "For nurses to provide compassionate care which treats patients with dignity and respect, higher levels will be needed and these should be determined by every health care provider." Katherine Murphy, chief executive of the Patients Association, said the Care Quality Commission had cited staffing levels as a key issue for patients. "Patients said they thought all staff, and in particular nurses, were overworked," she said. Elizabeth Rob, the chief executive of the Florence Nightingale Foundation - which is part of the Alliance - said adequate staffing was vital. Media captionElaine Inglesby-Burke, Nursing Director, Salford Royal: "Nurses will quickly get to burn-out"
"We already have fundamental standards in a range of areas: in maternity, in intensive care, in children's services - so this is not new," she said. "We just don't have it for the majority of general hospital wards, and that's really important - because it's where our most frail, most vulnerable elderly patients are, and it is our view that this has to be brought in." And Elaine Inglesby-Burke, nursing director at Salford Royal, said heavy workloads meant that at times "it comes across that nurses have lost their compassion and their care, when in actual fact they're too stressed and too laboured to be able to deliver compassionate care". Health minister Dan Poulter said it was for hospitals themselves to decide how many nurses they employed, and that they were best placed to do this. "Nursing leaders have been clear that hospitals should publish staffing details and the evidence to show that staff numbers are right for the care needs of the patients that they look after," he said. The minister said the soon-to-be appointed chief inspector of hospitals would be tasked with taking action if hospitals were found to be compromising patient care by not having the right number of staff on wards. But Dean Royles, chief executive of NHS Employers, said setting a minimum national nurse-to-patient ratio was not the best way to work out staffing levels. "The report does say, for example, that ratios of one-to-four or one-to-six are often provided, and that the majority of organisations do do that," he said. "To me it would be a tragedy if we started all working towards a national nursing ratio at the expense of those other professionals that are providing fantastic care to patients too." Meanwhile, Labour's shadow health secretary Andy Burnham said 10% of hospitals were understaffed and the NHS was engulfed in chaos. He said: "Ministers must intervene to stop the job losses and urgently bring forward a plan to ensure that all hospitals in England have enough staff to provide safe care."